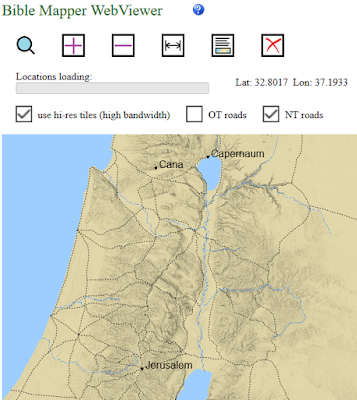 Biblical Studies and Technological Tools: New Bible Mapper WebViewer! 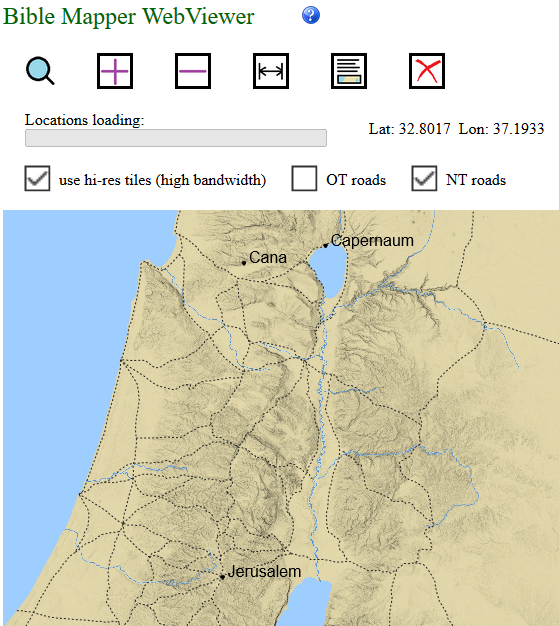 It is intended to be a quick reference tool for Bible geography information, not a way to make maps (there is not a way to save, export, or print a map other than the default tools of your browser). I envision people using it to look up Bible geographical information on the fly, such as on their mobile device at church or Bible study, or on their computer while studying a passage. You can also input a reference like "Joshua 10-12," or pass in a page URL, and it will automatically fetch the text and map all the locations it can discern on it (though it's definitely not 100%). Especially for its purpose as an quick reference, particularly for mobile devices, this is a very nice tool, and it's even better that Barrett is providing it for free. Thanks, David Barrett!